Can you confirm these amateur observations of Cryptoblepharus yulensis? Type locality: Yule Island, Central Province, Papua New Guinea, 8°49’S 146°32’E. Diagnosis Diagnosis (14 specimens). 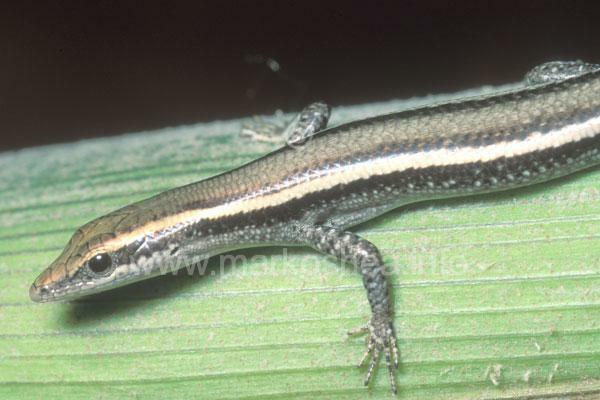 A medium sized (40–44 mm SVL), very short-legged, shallow-headed Cryptoblepharus. Distinguished from congeners by combination of: modal values of six supraciliary scales, 24 midbody scale rows, 53 paravertebral scales, 20 fourth toe subdigital lamellae and 16 fourth ﬁnger supradigital lamellae; mean values of head depth 42.4% of head length, forelimb length 32.9% of snout-vent length and hindlimb length 39.5% of snout-vent length, and simple body pattern with broad, brown vertebral zone and lack of speckling or blotches. Etymology Named in reference to Yule Island, type locality for this species.